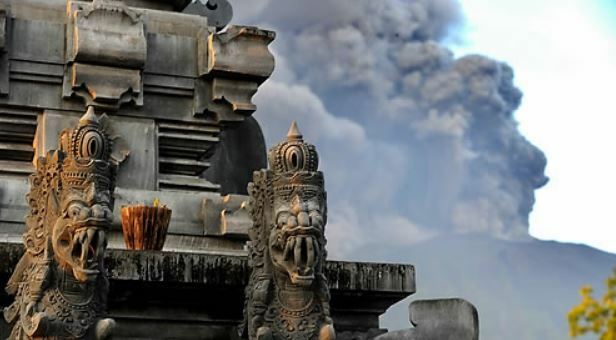 South Korea said Monday it plans to draw up measures to ensure the safety of its nationals on Indonesia's resort island of Bali, as the Southeast Asian nation has raised the volcano alert on the island to the highest level. The volcano at Mount Agung has been spewing plumes of smoke and ashes since last week, raising fears that a larger eruption is imminent, according to foreign media reports. Airports on Bali and neighboring island Lombok have been closed. Currently, about 20 South Korean tourists are stranded on Lombok, east of Bali, according to the Ministry of Foreign Affairs. As ash clouds have caused an airport on Lombok to suspend flights, the Seoul government said it plans to provide them with support, including alternative transportation, if necessary. "The South Korean embassy in Indonesia plans to come up with safety measures for South Koreans through cooperation with Indonesian authorities," the ministry said.